Screenshot via Auto Express, if you couldn’t tell. Sorry, but everyone is building performance SUVs nowadays, and that means they need to race each other. The first luxury SUV was introduced as the Mercedes M-Class in 1997, and the first performance SUV was probably, technically the Porsche Cayenne in 2002. It just took everybody else around a decade to catch on that SUVs were a thing that people like to buy, especially if they were super luxurious and just as quick as anything else. So today we have more performance SUVs; namely the $200,000 Range Rover SVAutobiography and the $230,000 Bentley Bentayga. Clearly they are very expensive and, as you’re about to witness, very very fast. 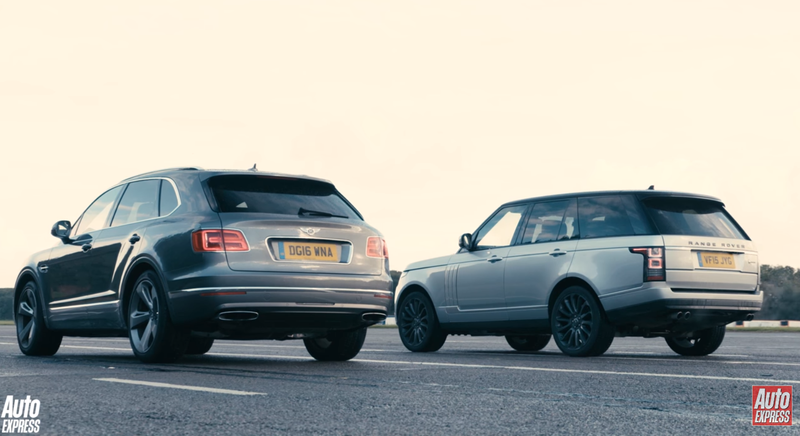 Welcome to the age of the performance SUV drag races. Make sure you strap down the groceries (or champagne bottles, in this case). Still, that was nothing compared to the potential of that SEMA show 220 mph Toyota Land Cruiser. While the result isn’t exactly astonishing, it’s kind of surprising to see just how ballistic the Ugly Giant can really go in a straight line. There’s an argument to be made that, in daily use “in the real world,” the additional $30,000+ for the Bentley probably just isn’t worth it. Either way, humankind’s giant road machines are getting quick. What will Rolls Royce, Lamborghini and Aston Martin do to keep up? (Electric power, probably). How Can Lamborghini Out-Crazy The Bentley Bentayga With Its SUV In 2018?